We value the ability of music to transform the energy, consciousness, and lives of individuals, and we believe that singing in the choir contributes to such a shift in both the choir members and our audiences, thereby creating a more just and loving world. Each of us will be an ambassador to enlist interest and support for the RVPC so as to grow its influence in our community. Singing for peace is a joyful, powerful act that opens our hearts and models vulnerability and trust—elements of peace building. When we sing, we open joy sources within us and for our audiences we never knew existed. We commit to showing up for rehearsals and performances to participate fully in that transformation. We believe strongly in our mission goals and select music that embodies passionately our vision and mission of peace, social justice, and environmental stewardship. We will examine our mission to reflect current world issues (social justice, environment) and we will participate as fully as possible in the music submission and selection process. 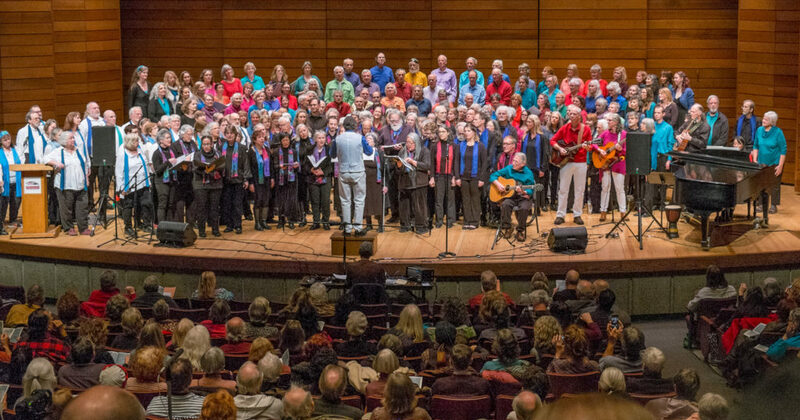 We value singing to audiences of all ages, races, religions, and sexual orientations and inspiring them to lean toward a world filled with peace, social justice, and environmental integrity. We will seek venues where we can sing to those who may not usually hear our songs and sing to all, including people who may not agree with our message. We will make a special effect to sing for children as one of our most important potential audiences. We believe that our best efforts will be brought forth by being a learning organization, where we can use different perspectives, talents, and energies to continually improve the songs we sing and our organization, using differences and missteps as opportunities to learn and grow stronger. We will use peaceful means to resolve differences and disputes, including alternative dispute resolution and other methods, recognizing that differences may erupt into conflicts if not tended to in a timely manner. We value a warm, friendly, inclusive, and nurturing atmosphere where people listen to and help each other so that members can bring forth their best talents. We believe in learning in a way that includes laughter and humor, keeping it light and fun. We value clarity of roles of members, Artistic Director, Board of Directors, and Leadership Teams. We use praise and demonstration to help any singer at any level to participate and grow. We will go out of our way to introduce ourselves and greet and welcome both new and returning members and help them feel included. We will seek to learn more about our fellow members, appreciating what they bring to the Peace Choir, and lending a helping hand when needed. We will work together with respect and appreciation for each other, our Artistic Director, our Board, and our Leadership Teams. We will define and update on a regular basis the roles of our Artistic Director, Board, and Leadership Teams, recognizing that our guidelines and policies are living documents, i.e., dynamic and subject to edits and updates as needed.